Six of Crows – Hey Ashers! Posted on March 12, 2016 October 22, 2016 by Liam @ Hey Ashers! A few years ago, I picked up Leigh Bardugo’s Shadow and Bone, the first installment in her Grisha trilogy. Picked it up, read it, and sold it to a used book store with equal parts disappointment and annoyance. The trilogy has since become popular, and I’ve been considering giving it another go–and then lo, Six of Crows was released, the first in a new series set in the same world as Shadow and Bone, but involving different characters in a different place and a (slightly) different time. Here was my chance to see if Bardugo’s storytelling abilities had improved enough since Shadow and Bone to make it worth my while to read the rest of the original trilogy. Well, I just finished Six of Crows. Is it perfect? No. Is it awesome? Yes. Definitely yes. Enough “yes” to make me think perhaps I should (eventually) give Bardugo’s earlier books another shot. Ketterdam, in case you can’t spot it, is the northernmost city on the little island of Kerch, located in the very bottom-middle of the map. The Ice Court is the capital of Fjerda, a country to the north-northeast of Kerch. Kaz — a.k.a. Dirtyhands. The brilliant, terrifying, near-legendary lieutenant of the Dregs gang (a fast-rising power in the Ketterdam slums). He of the well-tailored suits, the creepy shark-dead eyes, and the willingness to do any violence necessary to see his goals met. Inej — a.k.a. the Wraith. A supernaturally-gifted Suli acrobat kidnapped from her family’s caravan by slavers and sold to a brothel madam in Ketterdam, but now putting her acrobat’s stealth and agility (as well as her many knives) to work as the Dregs’ intelligence-gatherer. Matthias — a Fjerdan drüskelle (read: witchhunter), whose past encounter with Nina (a witch) condemned him to the disgusting, brutal prison in Ketterdam. He’s the eldest of the group at eighteen years old, and stiff with both murderous rage and monk-like drüskelle honor. Nina — a Ravkan soldier from the east, now stranded in Ketterdam, trained to use her magic to kill her enemies without touching them: stop their hearts, snap their necks, collapse their lungs, etc. She’s currently employed by the Dregs to heal gang members’ wounds (as best she can, having been trained to kill rather than heal). Jesper — a Zemeni farm boy whose gambling addiction doomed him to the gutters of Ketterdam, but whose sniper abilities found him a place amongst the Dregs. Wylan — a wealthy merchant’s son who ran away from home and was accepted into the Dregs (as a hostage for use against his powerful father). And, hey, his expensive education could come in handy. –for its dark, hands-bloody teeth-bared story. 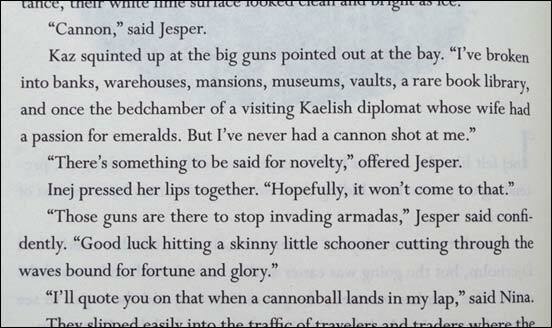 Bardugo’s writing style is definitely improving. and watching those distinct personalities clash. The crew also includes one (it seems openly) bisexual young man, one potentially bisexual or gay young man (I suspect we’ll find out in the sequel), and a character whose permanent, painful limp is eased somewhat by the use of a cane. With such a diverse group, you’d expect the characters to harbor some or a lot of prejudices about the others–and hallelujah, they do. It’s not just personalities clashing that makes so many of their interactions interesting to read; it’s seeing their prejudices at work, and watching those prejudices shift over time as they come to understand each other more. And yes, some of their interactions are of the more romantic variety, but they’re romantic in a way that fits the book’s tone and story: grim, conflicted, wary, almost (almost) hopeless. There’s no place for warm cuddles and, I don’t know, waltzes under the moonlight in the gutters of Ketterdam, and definitely not during the heist itself. But that doesn’t stop romantic bonds from forming, in their various ways–and that’s something else to praise: the romances are so very different from each other. If this book had ended with identical happily-ever-afters for such vastly different couples in such a grim story, I’d have thrown the book across the room. Or at least written a very long, ranting letter to you about it. Holy crap do I love the use of rotating narrators in this book. The story’s told from five viewpoints: Inej, Kaz, Nina, Jesper, and Matthias. 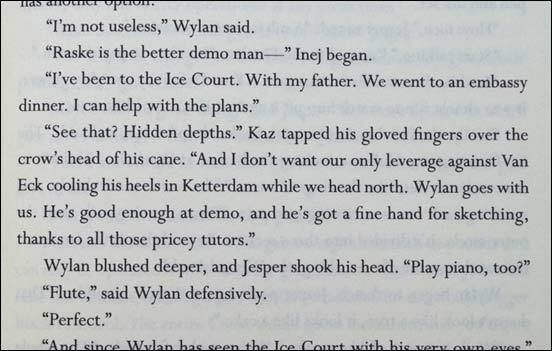 No, rich boy Wylan doesn’t narrate. This is especially neat because we’re shown each narrator’s backstory in bits and pieces that are scattered throughout the heist plot–and each person’s backstory affects not only who they are as people and their interactions with the other characters, but also the heist itself. I never felt impatient with the (sometimes lengthy) sections of backstory, because I was genuinely interested in learning more about what made these people who they are. Two cheers for that. In a story that rotates narrators, especially when those narrators have such different personalities and ethnic/religious/economic (etc.) backgrounds, you would hope that each narrator’s voice would be distinct, both in and out of dialogue. I’ll point to Maggie Stiefvater’s The Raven Boys as a good example. But most of the narrators in Six of Crows sounded rather the same to me: ruthless, brave, and quippy. Matthias and Inej were (usually) the exception to this rule; Matthias was brusque, both in his narrative and in his dialogue, while Inej leaned toward disapproving silence. But for the most part, if I opened the book at random and read a few paragraphs, I probably wouldn’t be able to tell you who was narrating. And if those paragraphs included dialogue without names attached, I probably couldn’t guess who was speaking. This is a skill that Bardugo will perfect with more practice–and if the improvement in her writing in the last three years is any indication, it won’t take her long. Okay. I don’t want to spoil anything, so let me cover this complaint as vaguely as possible. 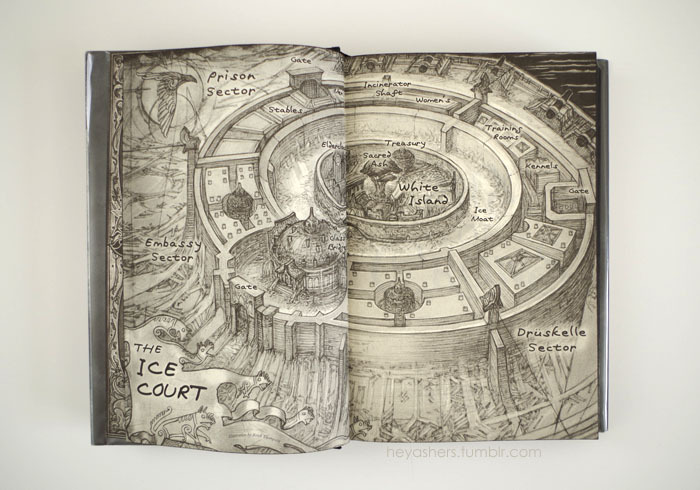 Kaz and his team have to penetrate the impenetrable Ice Court, which (as you can see in the second map I provided above) is a large fortress-like complex. Kaz, being the criminal genius he is, has a sharp mind (bordering on supernatural gift) for analyzing a situation (or person, or place) and coming up with a plan; he always seems to be a mile ahead of everyone else in both the analyzing and the planning departments. There’s no reason for this–except, of course, it made for a more interesting climax. To which I say for the thousandth time: authors, stop making your characters dumb for the sake of an interesting climax. Find a better way to do it. It happens again a very short time later: again, Kaz didn’t expect to meet resistance where, again, I (and surely anyone else with two brain cells to rub together) did expect him to. But this time, the resistance that he should’ve met wasn’t there. At all. Not even a hint of resistance. None. The utter lack of resistance was grossly unrealistic, and seriously disappointing in a book that seemed to try very hard at realism in all other aspects. My guess as to why they didn’t meet resistance where they should have: if they had, they very likely would’ve all been slaughtered, and that doesn’t make for a very emotionally satisfying conclusion. But surely there’s a better way to avoid their slaughter than by having them meet no resistance at all? I’ll admit, Six of Crows wasn’t as emotionally powerful a motley-crew-attempts-daring-heist story as Mistborn was–but that won’t stop it from joining my permanent collection. Probably in hardback, too, because have you seen how gorgeous it is? And you know, this looks like just the afternoon to raid the bookstore. I’m starting to feel like we don’t have much in common with our reading tastes since I actually liked the Grisha trilogy (and The Winner’s Curse as we talked about before) okay. However, I’m glad that you seemed to enjoy this more. Six of Crows has received a lot of hype and I actually preordered it back in October but still haven’t had a chance to read it. Everyone has raved about the characters like you did; I’m relieved to hear it lives up on that front. Nice review, Liam! Also, I wanted to say that I just read your “about” page and I love the meaning behind why you started Hey Ashers! And I’m sorry for your loss with Lizzy. Your friends seem like extraordinary people. Anyway, keep on writing the insightful, in-depth reviews. Happy reading and blogging! It’s true, I can be a reading grump. But I’m looking forward to trying out the Grisha trilogy again, and finding out what everyone loves so much about it! I do remember being fascinated by the world Bardugo created, and very much intrigued by the Darkling. Honestly I wouldn’t bother with the first Grisha books. They’re fine, but nothing special. There’s only one really great character in there and Bardugo doesn’t so a whole lot with him It’s very frustrating! I have hopes he might yet show up in the Six of Crows universe but I doubt it’ll happen. I loved this book. 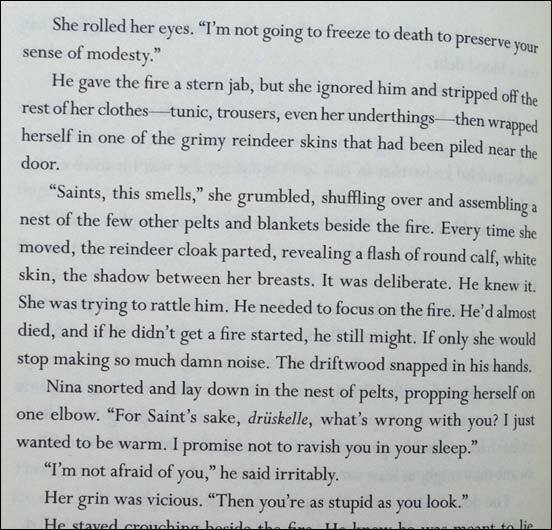 There are a couple exchanges between Matthias and Inej that left me with a massive, uncontrollable grin on my face. Inej was my favourite of the group. I also loved that Kaz has a disability! There are so few characters with disabilities in YA. Hm, if that’s the case, I very well may skip them. As it stands, they’re very near the bottom of my TBR–which means they may as well not be on it at all. I’m so glad you liked it! Oh man, Matthias and Inej had some fantastic interactions (Inej and almost everyone had fantastic interactions, because you’re right, she’s the best), and I can’t wait to see more. You’ll probably get to the sequel before I do, so I’ll be looking forward to your review of it! Here’s hoping it builds well on this first book. Thank you! Ugh, I just want it to come out now! I am very impatient. Wouldn’t you say there was resistance when they almost made it to the ship and then they got attacked? So Nina has to sacrifice herself to save the team. I like this book a lot more than The Wrath & the Dawn because the characters are clever and there were many challenges. 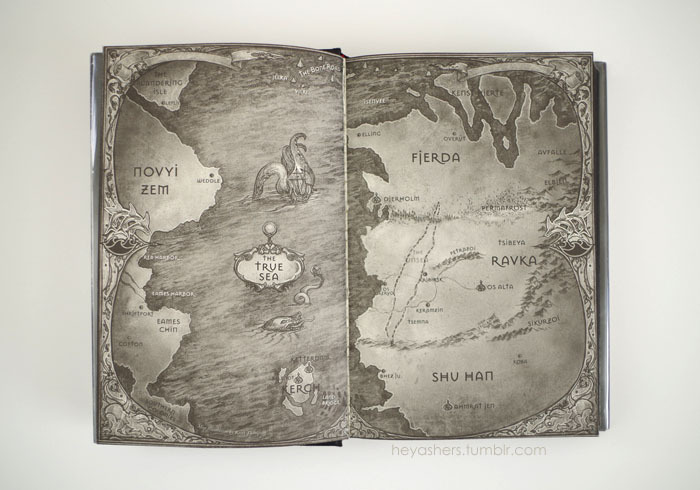 I like that you put pictures of the maps here because I had a hard time imagining the world and surroundings. Great review! I totally agree that this book blows TWatD away! This is such an amazing book, while TWatD didn’t quite live up to its potential. Yeah but I think after all the hardships they went through, they just want to get out of there. So to have the attack when they were so close, that was least expected.